Index prepared by U.S. Chamber of Commerce’s Global Innovation Policy Center (GIPC). India has taken several noteworthy steps to improve its IP system in 2018 and also performed well on the new indicators included in the Index this year. The Government of India take steps to improve its national IP environment and these efforts continued in 2018 and progress has been made on several important areas measured by the Index. Greater efforts were made to align and incorporate India’s IP environment with the international IP system. India’s accession to the WIPO Internet Treaties and subsequent agreement with the Japanese Patent Office on a pilot PPH both stand out. India also invested considerable energy into decreasing pendency rates for patent and trademark applications by hiring staff and investments in resources for modernising and improving the administrative capacities of the Office of the Controller General of Patents, Designs and Trademarks (CGPDTM). As a result, the application backlog had been reduced from over 200,000 pending applications in March 2017 to just over 155,000 applications by end of June 2018. CPI ranks countries on a scale of zero (highly corrupt) to 100 (very clean) based on their perceived levels of corruption in the public sector. The index is compiled by using data of World Bank, World Economic Forum (WEF) and other institutions. It describes changes occurring in the global risks landscape from year to year and identifies global catastrophic risks. The report also examines the interconnectedness of risks and considers how the strategies for the mitigation of global risks might be structured. The list of biggest risks to likelihood is topped by extreme weather events such as floods and storms, followed by failure of climate-change mitigation and adaptation, major natural disasters like earthquake, tsunami, volcanic eruption and geomagnetic storms; the massive incident of data fraud/theft; and large-scale cyber attacks. Index released by NITI Aayog. According to the SDG Index, Himachal Pradesh, Kerala, and Tamil Nadu have been ranked on top 3 positions and are on track to achieve the UN Sustainable Development Goals (SDG). Index aims to promote healthy competition among States by evaluating their progress in social, economic and environmental terms that will help India in achieving the UN Sustainable Development Goals (SDG) by 2030. Based on the performance of the States and UTs across 13 of the 17 identified SDGs, a score ranging between 0 and 100 has been assigned to each of them in the index. Chandigarh has been declared as the front runner in the Index with a score of 68 among the UTS. Assam, Bihar and Uttar Pradesh are at the bottom of the rankings in the NITI Aayog’s Sustainable Development Goals Index . Index was released as part of World Economic Forum’s (WEF) Global Gender Gap Report 2018. Countries are ranked based scores on scale ranging from 0 (lowest i.e. imparity) to 1 (highest i.e. parity). It is released every year by WEF since 2006. India has the highest number of ‘stunted’ children in the world. Nearly a third of all stunted children worldwide are to be found in India. About 46.6 million children in India suffer from stunting due to poor nutrition intake in the long term and repeated infections. India is also the country with the highest number of children who are ‘wasted’. This is an even more severe indicator of acute malnutrition. India has 25.5 million children who are wasted. Among the 50.5 million children who are wasted globally, India has half of the global wasting burden. 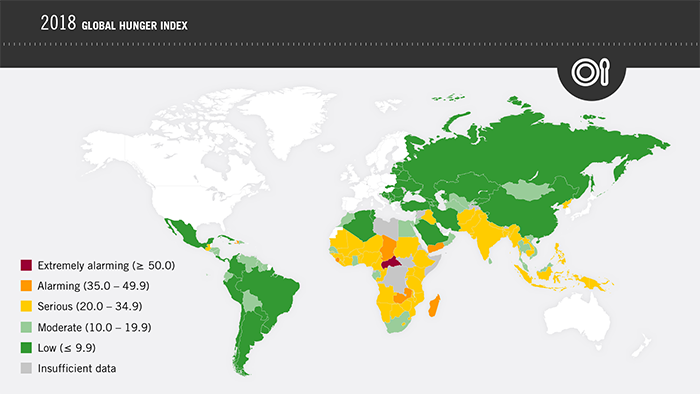 Index is released by Washington-based International Food Policy Research Institute (IFPRI). At least one in five Indian children under the age of five are ‘wasted,’ which means they have extremely low weight for their height, reflecting acute under-nutrition. The only country with a higher prevalence of child wasting is the war-torn nation of South Sudan. The GHI is a multidimensional statistical tool used to describe the state of countries’ hunger situation. It is released annually by IFPRI since 2006. It ranks countries on a 100-point scale. Zero on the scale is the best score (no hunger), and 100 is the worst. It highlights successes and failures in hunger reduction and provides insights into the drivers of hunger. Thus, GHI aims to trigger actions to reduce hunger. Infant mortality rate (1/3rd weight). Stunting: Deficiency in height in relation to age, reflects chronic undernutrition. Wasting: Low weight in relation to a child’s height, reflects acute undernutrition. India has jumped 23 ranks to attain 77th spot from 100th position in Ease of Doing Business Index 2017. Report is published by World Bank. India figures among top 10 countries that have marked an improvement this year. In case of India, Delhi and Mumbai are only two cities surveyed by World Bank for this rankings. 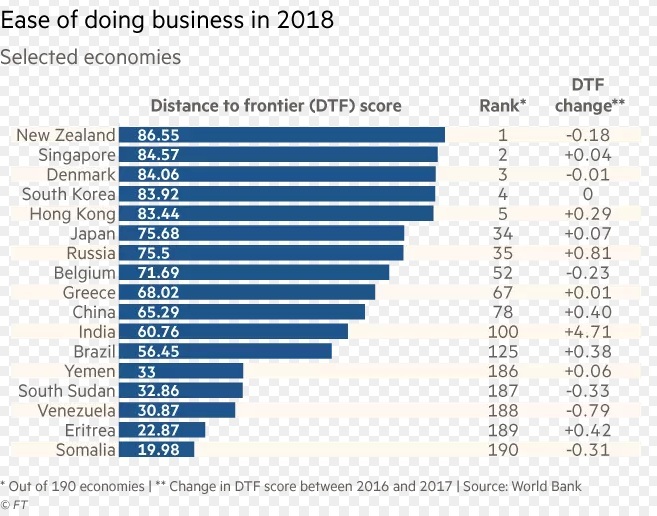 Its jump in ranking was aided largely by improvement in areas such as “trading across borders”, “dealing with construction permits”, “getting electricity”, “getting credit” and “starting a business”. It has improved in rank in six out of ten indicators. It has moved closer to international best practice. India was ranked 28th among 73 countries. India has jumped by eight positions in this ranking from 36th in 2011 which reinforces country’s progress towards digital transformation. Norway has topped 2018 GEAR list. It is an Economist Intelligence Unit (EIU) global Index and benchmarking study commissioned by financial services corporation Visa. It ranks governments by quantifying their e-payment capabilities based on various indicators. India ranks 158th in the world for its investments in education and health care. India is ranked at 158 out of 195 countries in 2016, an improvement from its position of 162 in 1990. The findings show the association between investments in education and health and improved human capital and GDP.